I just wanted to highlight the presentation from Peter Gabryanczy - Migrating akka-camel module to Akka 2.x. In this video, Peter demonstrates how well Camel and Akka works together, showcasing demos with code that's less than a page, but still does powerful stuff, integrating mail, jms, file, akka, twitter, aws and whatnot. The video is available from this link, where the video player is on the top right corner. In the end of the presentation, Peter talks about the jobs application he has built that gathers details about new Scala jobs. Peter is using Camel 2.8, and therefore the integration with twitter and AWS dynamoDB is not yet available. However, the Camel team is, as usual, busy, and in the upcoming Camel 2.10 we have these components out of the box. 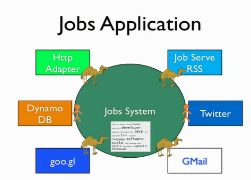 So Peter can build his application using all-out-of-the-box Camel components. In the end, Peter thanks a bunch of people who have helped make this possible. I want to highlight Martin Krasser, the original author of the akka-camel module. Martin also contributed to the Camel in Action book, in which he wrote a piece on his work.